A few weeks ago, Leo and I made a quick day trip to Charleston, SC to visit with his son and the 3 grandgirls. And as a bonus, Kris gave us a pint of frozen blue crab meat to take home with us. 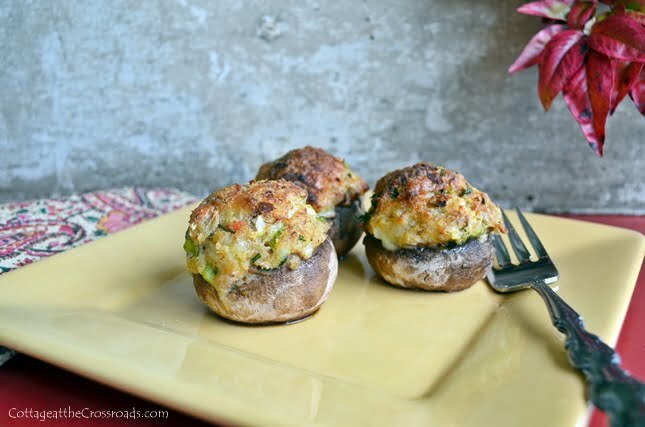 The crabs were caught and fresh-picked by Kris and the girls, and now I had a chance to try Kris’ recipe for stuffed mushrooms that he had sent me a while back. And it is oh, so good! Food heaven for seafood lovers! To make this recipe you will need 2 cups of crab meat. 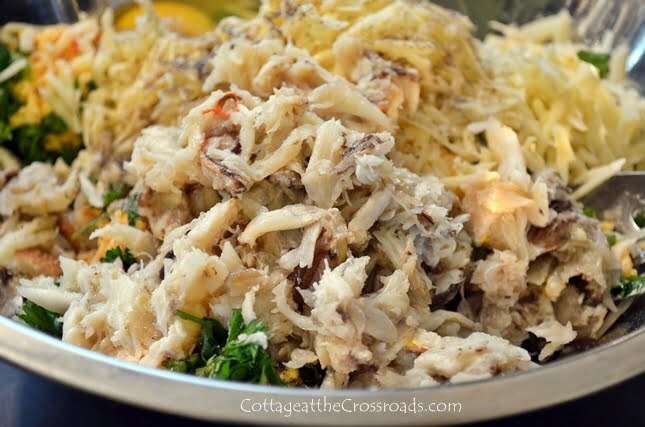 Fresh or frozen crab meat would be the best but if you are too far inland, you could use canned or pasteurized crab. 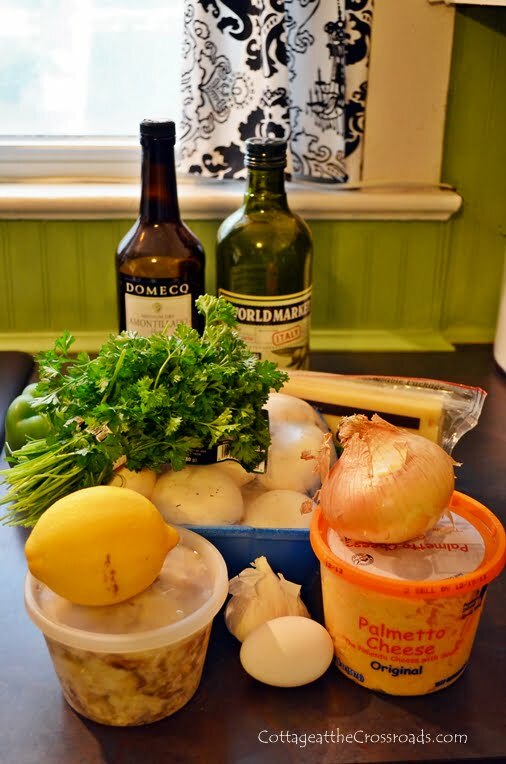 Along with the crab, you will need a package of large, white mushrooms, a clove a garlic, 1 small onion, 1 green pepper, fresh parsley, 1 lemon, 1 egg, stone-ground mustard,1/2 cup grated Gruyere cheese, olive oil, cooking sherry, a small loaf of French bread and some bacon. And one other special ingredient is Pawley’s Island Original Palmetto Cheese. You aren’t familiar with pimiento cheese? Well, it’s so widely eaten in the South that it’s earned the nickname of “Southern Caviar.” We eat it with everything, and cooks vie to have the best homemade version. But I don’t even bother to make it at home anymore since this became widely available in grocery stores. 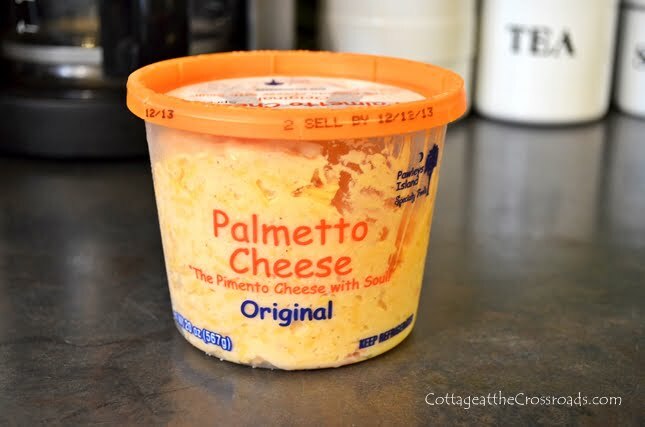 It is the BEST, and if you’ve never tried it, you can go on the Palmetto Cheese website and find where it’s available or even have it shipped to your home. I suppose you could substitute another brand of pimiento cheese in this recipe, but it won’t. be.the.same! 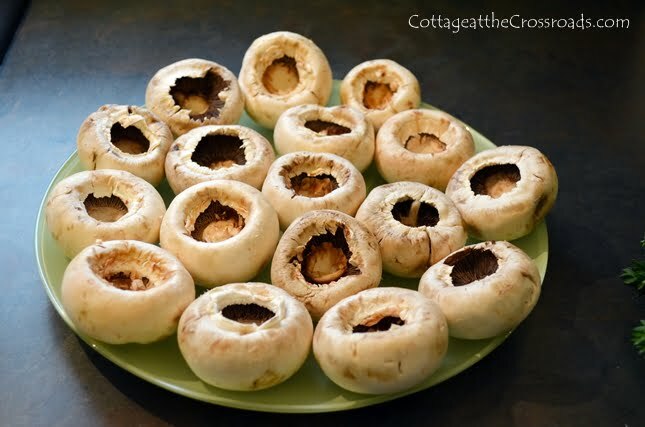 The first step is to wash your mushrooms. To keep them from getting soggy, just do a quick rinse and use a paper towel to wipe them off. Carefully remove the stems. If some seem difficult to pull out, take a small knife and run it around the stem to loosen them. There were 17 mushrooms in this package, and this recipe made plenty to stuff all of these with just a little bit left over. 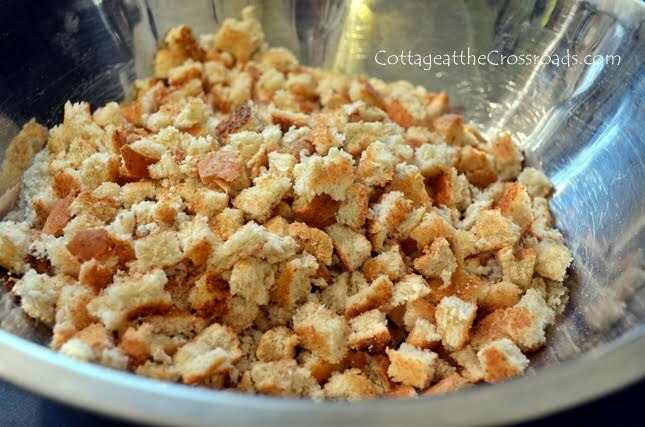 Take 1/2 of your loaf of French bread, toast it, and chop it into fine pieces. 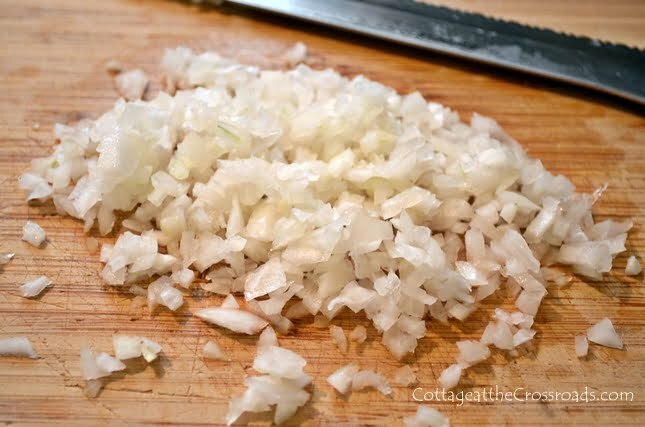 Mince 1/2 of a small onion and 1 clove of garlic. 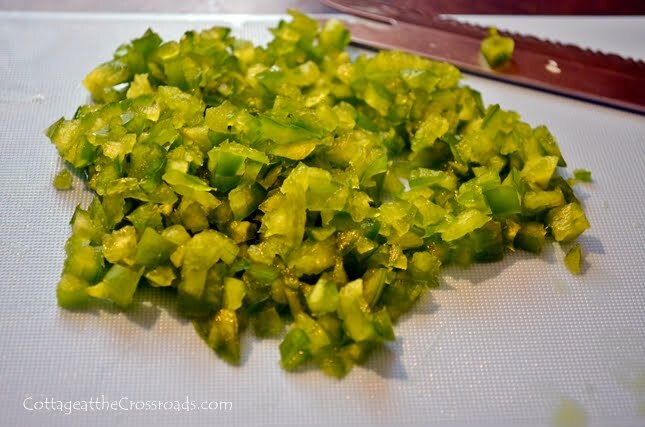 Finely chop 1/2 of a green pepper. 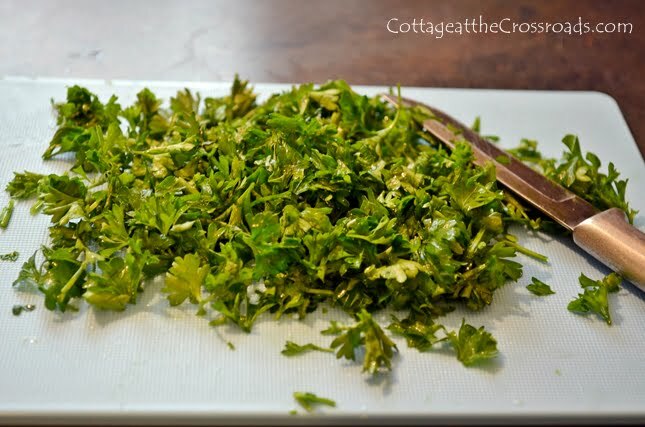 And chop 1/2 cup fresh parsley. Whew! That’s a lot of chopping but you’re done with that part now! Toss all these ingredients into the bowl of breadcrumbs along with 2 cups of crab meat, a teaspoon of stone ground mustard, 1 egg, 1/2 teaspoon cooking sherry, 1 tablespoon olive oil, 1/2 cup grated Gruyere cheese, 1 teaspoon fresh lemon juice, and 3 strips of bacon that have been crisply fried and chopped. (You don’t see the bacon in the photo because I sent Leo to the grocery store and he came back without it!) Season with salt and pepper to taste. At this point, go ahead and preheat your over to 375 degrees and then mix all of the ingredients together with your hands. That’s the only way to fully combine everything together. 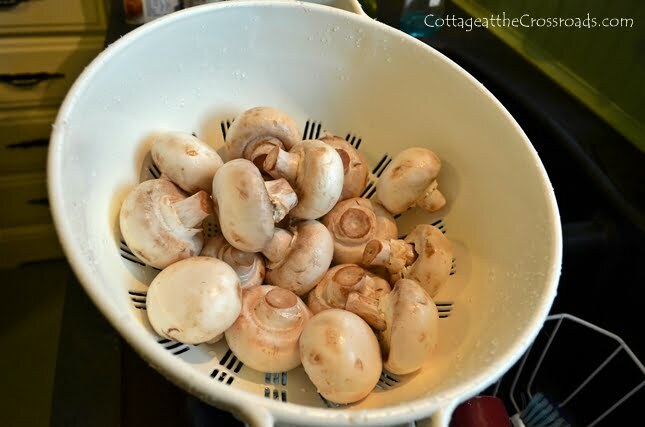 Generously stuff your mushrooms and place them in a casserole dish. 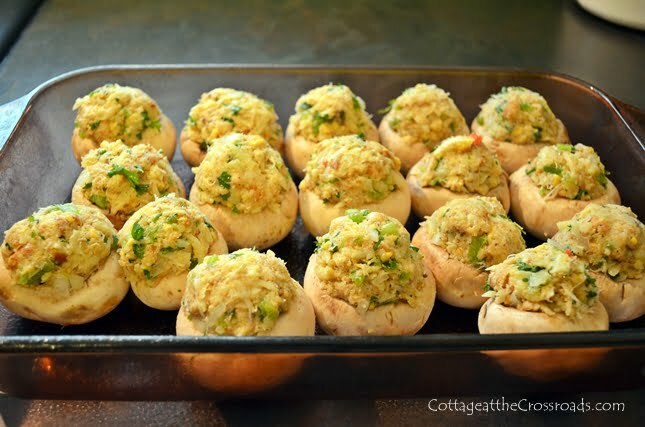 If you have a little stuffing left over, put it in a small dish and bake it along with the stuffed mushrooms. Bake at 375 degrees for 20 to 25 minutes until the stuffing turns golden brown. Oh my! These were so good! 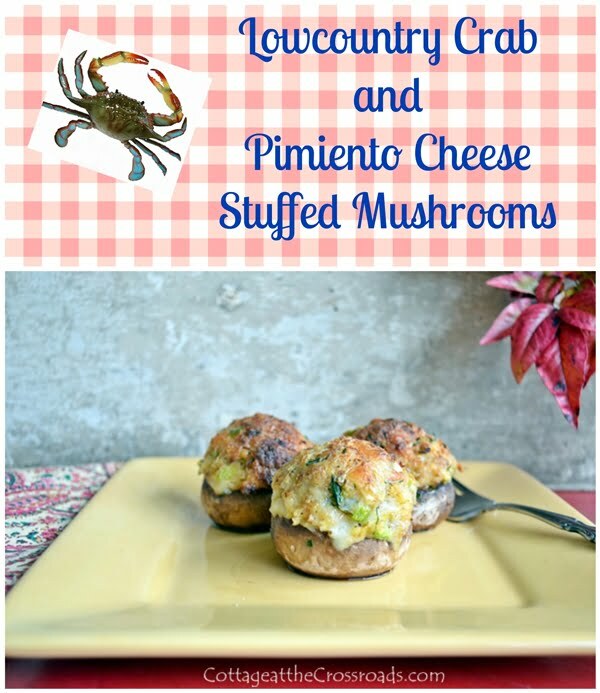 A special thanks goes to Kris (who keeps our blog up and running, by the way) for the gift of the blue crab and this recipe! As a seafood lover, I was truly in heaven! A salad, some wine and it’s what ‘s for dinner this weekend!! yummmmm!!! Thanks for sharing!! Thanks for sharing this recipe with the world. FYI. 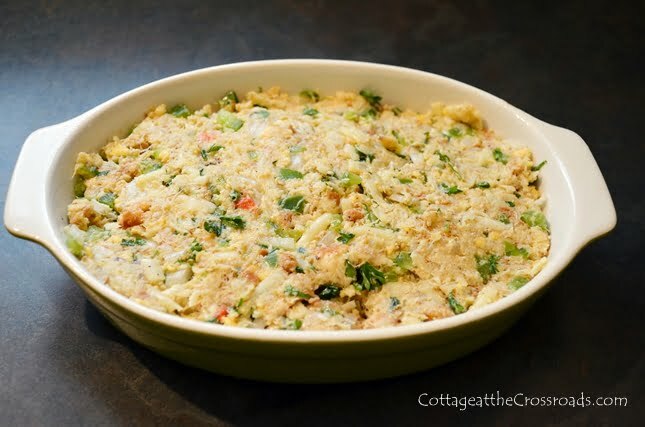 The left over stuffing makes great crab cakes either baked or fried. These look soooooo yummy…I have printed out the recipe and now I will pin it to. I go thru this pimento cheese like milk:) Our stores don’t carry that larger size…wished they did. Looking forward to making this soon for my family. Thanks so much for sharing.